Gardening Friends of the Big Bend and Magnolia Society International present “Magnificent Magnolias” Saturday, February 14, at the UF-North Florida Research and Education Center (NFREC) in Quincy, Learn about the many different varieties of magnolias adapted to our area as well as our many beautiful native magnolias. After indoor presentations, magnolia experts will lead a walking tour through a Magnolia Garden containing more than 150 different magnolias, many of which will be in full bloom. Members of the Magnolia Family are prized worldwide for their flowers and have become some of the most widely planted trees. Since 2000, Environmental Horticulture Professor Gary Knox has developed a collection of magnolias that is recognized as part of the NAPCC National Collection of Magnolia. Sponsored by Gardening Friends of the Big Bend (GFBB) and Magnolia Society International, the February 14 program includes special guest speaker Dr. John Tobe along with NFREC's Gary Knox. Well-known to gardeners in our area, Dr. John Tobe will speak about the various magnolias native to the Gulf Coast and Coastal Plain, and how to incorporate them into our gardens and landscapes. Incidentally, John and his family are the creators of Tobe Botanical Garden in Quitman, Georgia. This beautiful garden features magnolias, many of which were shared with Gary to help create the Magnolia Garden. UF-NFREC’s Gary Knox, new President of Magnolia Society International, will report on the best performing magnolias in the Magnolia Garden at NFREC, based on 15 years of data and observations. Magnolia Society International is a non-profit organization, with more than 700 members world-wide, whose mission is to inform, educate and inspire people, from backyard gardeners to botanists, to learn more about the cultivation and conservation of magnolias. Following the presentations and a break, participants will caravan across the street to the Magnolia Garden where Gary Knox and John Tobe will lead a walking tour highlighting the best magnolias. Upon returning from the Magnolia Garden Tour, GFBB will host a plant sale featuring several magnolias, as well as other seasonal plants. Proceeds are used by GFBB to support ornamental horticulture research and extension at NFREC. Where:University of Florida/IFAS, North Florida Research and Education Center, off Pat Thomas Highway, SR 267 at 155 Research Road, Quincy, FL. Located just north of I-10 Exit 181, 3 miles south of Quincy. 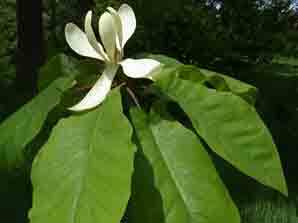 Presented by Gardening Friends of the Big Bend, Magnolia Society International and the University of Florida/IFAS North Florida Research and Education Center. On April 21, MSI President Andrew Bunting lectured at an annual magnolia day at Rare Find Nursery in Jackson, New Jersey. This event not only promoted a greater appreciation for Magnolias, but also allowed attendees to shop. Magnoliaphile Ron Rabideau was the host. Over the years he has amassed an incredible collection of magnolias, many of which are now available in the Rare Find catalog, both printed and on-line. “Magnolias for the Home ” was a well-received and appropriate talk at this location.